Here's an interview I did with Margaret Roach for The New York Times about putting plants together. I love Margaret's concept of reading a plant's "body language." Such a simple translation of my jargon. Why we need amazing communicators like her. Thomas Rainer’s work is a revelation: It turns out that plans are social, and have a body language that explains what they need. Thomas Rainer and I have both been doing the botanical thing for decades; we know, and use, many of the same plants — and even much of the same horticultural vocabulary. But what he and I see when we look at a butterfly weed or a coneflower, or what we mean when we say familiar words like “layering” or “ground cover,” is surprisingly not synonymous. It turns out I’ve been missing what the plants were trying to tell me, failing to read botanical body language and behavior that could help me put plants together in combinations that would solve challenges that many of us have: Beds that aren’t quite working visually, and garden areas that don’t function without lots of maintenance. As we gardeners shop the catalogs or the just-opening local garden centers with an eye to finally “fixing” that bed out front that has never quite cooperated, I asked Mr. Rainer, a landscape architect based in Washington, D.C., to lend us his 3-D vision. California’s wildflower superbloom is so massive, it can be seen from space. After four years of drought, southern California received a desperately needed ten inches of rain this winter. The dry landscape soaked up this rain, waited, then exploded with color. 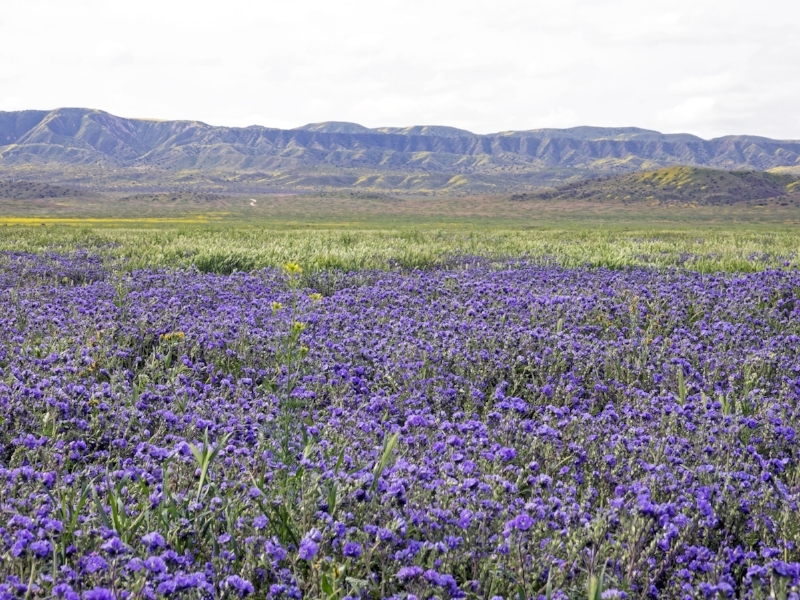 The Carrizo plain, described as the epi-center of this event, burst with lupine, poppies, fiddleneck, and baby blue eyes. Subtle shifts in topography created clear delineations in color, so painterly, so seemingly designed, that it almost defied credibility. One slope of canary-pineapple-custard-yellow met another field of tangerine-rust-creamsicle-papaya along a seam of indigo-berry-blue. The impact of the superbloom defied scale: one square foot was as stunning in its detail as several square miles. Of course, the event was so spectacular that it drew a stampede of people coming to photograph it. Mashable had an interesting article about tourists trampling fields of poppies. It’s funny how in a digital age when confronted with an event of great beauty, our first temptation is to pull out our smartphone. Moses, in the presence of the Almighty, shielded his face with a veil; we, in the presence of overwhelming beauty, shield ourselves with our iPhones. I noticed this phenomenon when I visited Chicago’s Lurie Garden—a two-acre perennial garden designed by Piet Oudolf—in its October glory. Everywhere I walked, outstretched arms with tiny rectangles focused and clicked. The current director told me the biggest threat to the garden was not rabbits or voles, but tourists in search of the Echinacea pallida-selfie. Wordsworth wrote odes to daffodils; Cezanne painted canvases; teenagers carved their initials on beech trunks. We now immortalize our experiences on Instagram. But what does it mean? Nothing and everything. In some ways, extracting meaning from an event of such majesty is like clamping beauty itself under the vice grips—dissecting its organs and placing them into formaldehyde filled jars. Language does not amplify, it shrinks. So part of me says: "leave it alone!" 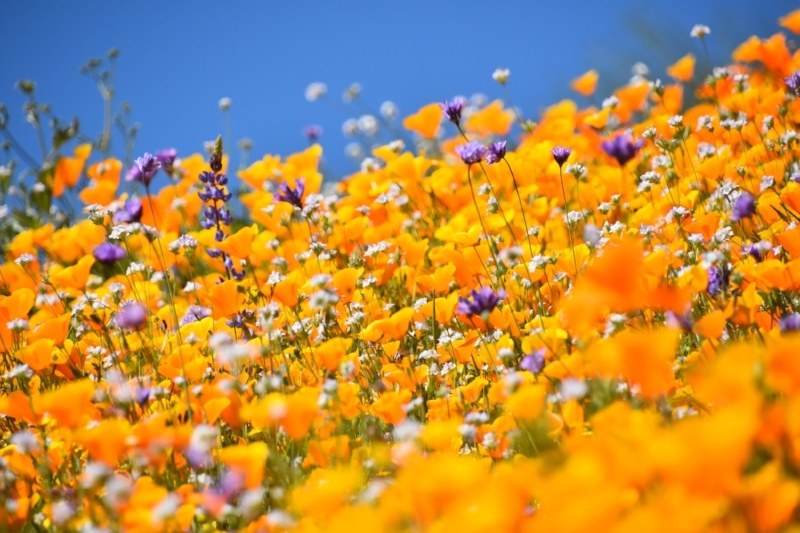 The superbloom merely is, and that is enough, now please shut up and go back to your spreadsheets. Yet the fact that my mind keeps going back to it, the tingly excitement I feel when I think of it, says it means something to me. 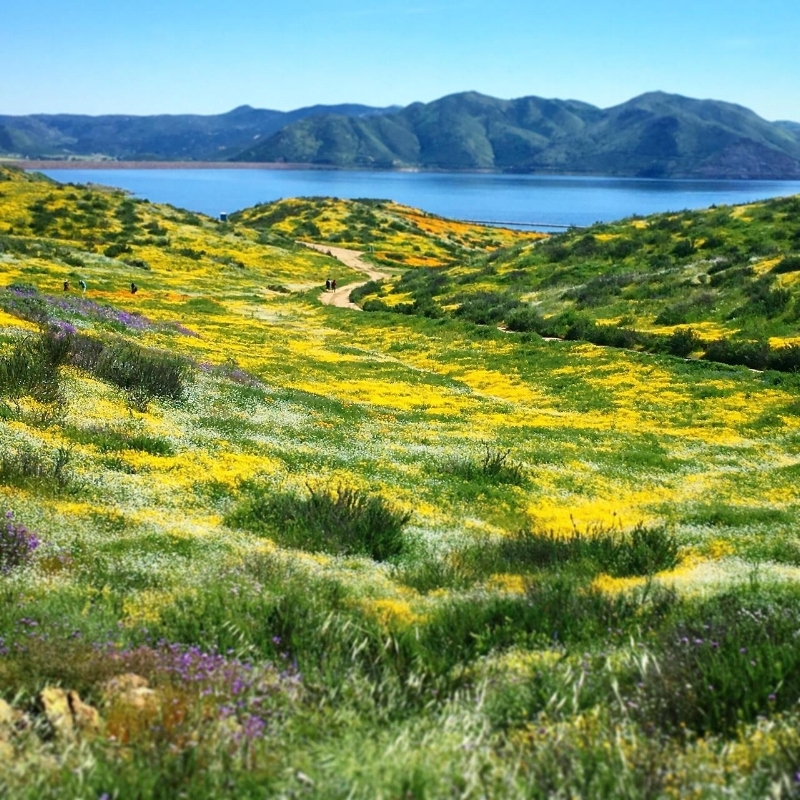 To open one’s mind to the mere existence of a superbloom shreds all kinds of narratives: the end of nature, the hopelessness of our times, the loss of wildness. “‘Post-truth’ does not exist in the opening of tree buds,” wrote David George Haskell in a recent editorial in The New York Times. He concludes that attentiveness to the lives of others—insect, flower, mammal, our neighbors—is an act of resistance in itself. Yes! A resistance. That’s exactly the way I experienced this event. The fact is, I needed this superbloom. Like the dry California landscape, I was thirsty for a reminder that the world still holds so much beauty, thirsty to be reminded by the power of wildness, and the extraordinary resiliency of self-organizing systems. Despite the ravages of globalization and industrialization, despite the multiple extinctions of biodiversity happening at this very second, the fact that nature still has the capacity to overwhelm us with its beauty, fecundity, and majesty is the most singularly hopeful event I can imagine. Let it in. The mind wants to live forever, or to learn a very good reason why not. The mind wants the world to return its love, or its awareness; the mind wants to know all the world, and all eternity, and God. The mind’s sidekick, however, will settle for two eggs over easy. The dear, stupid body is as easily satisfied as a spaniel. And, incredibly, the simple spaniel can lure the brawling mind to its dish. It is everlastingly funny that the proud, metaphysically ambitious, clamoring mind will hush if you give it an egg. So I bid you, dear readers, happy breakfasts! Since I cannot see the superbloom in person, I will happily consume images of it on Instagram while eating my cereal. And I will be grateful for the defiance of annuals. The big shift I see in horticulture over the next decade is a shift from thinking about plants as individual objects to thinking about plants as social networks--that is, communities of compatible species interwoven in dense mosaics. The advantages of this approach are huge (particularly with green infrastructure), but the challenge is that it is hard to do. Part of the difficulty comes in not understanding how to layer plants one on top of each other; it's very different than traditional horticulture. Traditional horticulture is place-based. Plants are arranged, often in masses of the same species, based on location. So to try to clarify the idea of vertically layered planting, I want to offer a different way of thinking about plant arrangement: modularity. 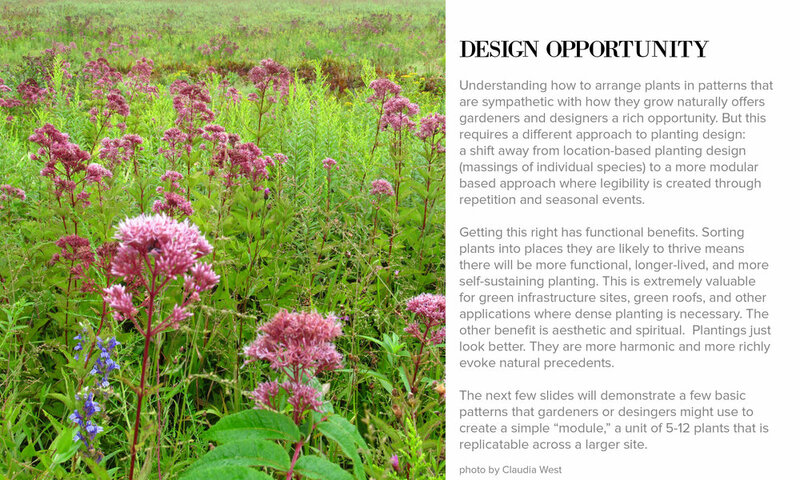 So in this post, I'm offering a slide show (above) to explain how to use the idea of modularity as a tool for certain types of planting applications. The concept of modularity has driven innovation in design since well before the industrial revolution. Modular design seeks to create discrete scalable, reusable units that can be separated and recombined. The number of resulting combinations are endless. Modular design combines the best aspects of standardization with customization. Modularity also works in natural systems. In biology, modularity refers to the ability of a system to organize discrete, individual units that can overall increase the efficiency of the network. Modularity is observed in all systems, and can be studied at nearly every scale of biological organization, from molecular interactions all the way up to the whole organism. 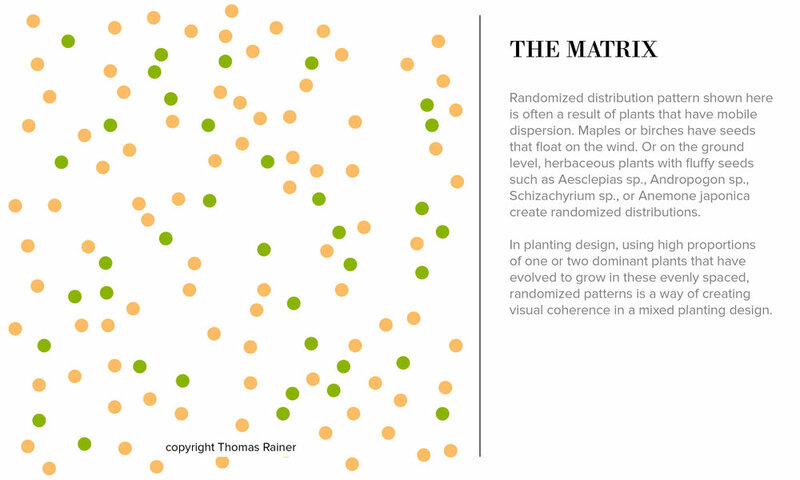 Understanding natural plant patterns is the key to understanding how to use modularity in planting design. The patterns that different plant populations make are a result of two primary factors. First, the terrain itself--and its associated topography, hydrology, soil composition, and geology--attract or repel certain plants. Second, plant dispersal patterns are directly related to how a plant reproduces itself. Some environments are relatively uniform and some are patchy. More uniform environments like a steppe (dry grassland) tend to produce evenly dispersed patterns, whereas rock outcroppings with its various depressions and moisture levels produce more visibly segregated populations. Similarly, a plant that disperses itself by seeds that float on the wind, for example, will produce different patterns than a plant that catapults seed within a few feet of itself or plant that spreads by rhizomes. Patterns are both place-dependent and species specific. Understanding how to arrange plants in patterns that are sympathetic with how they grow naturally offers gardeners and designers a rich opportunity. But this requires a different approach to planting design: a shift away from location-based planting design (massings of individual species) to a more modular based approach where legibility is created through repetition and seasonal events. Getting this right has functional benefits. Sorting plants into places they are likely to thrive means there will be more functional, longer-lived, and more self-sustaining planting. This is extremely valuable for green infrastructure sites, green roofs, and other applications where dense planting is necessary. The other benefit is aesthetic and spiritual. Plantings just look better. They are more harmonic and more richly evoke natural precedents. The slides above demonstrate a few basic patterns that gardeners or designers might use to create a simple “module,” a unit of 5-12 plants that can be replicated across a larger site. Not treating plants as dynamic systems is the culprit. MUnicipalities need to turn to experts in plant community design. For the past few years, I have been focused on the development of high performance vegetative systems. These systems are critical to the future of our planet, because as we urbanize, we need resilient plant systems to cover our roofs, clean our stormwater, sequester carbon, feed pollinators, and delight humans. The benefits are enormous, yet the fact is, getting the planting right is incredibly complicated. The problem is that the vast majority of green infrastructure plantings have failed. In fact, the very standards that regulate these facilities guarantee that the plantings will fail both functionally and aesthetically. This fact was highlighted in an article this week in The New York Times, "To the City a Pollution Fighter. To Some Residents, an Eyesore." As cities push to expand these facilities throughout cities, some residents aren't so impressed. And who can blame them? Many of these facilities have poorly designed forebays, so they are filled with trash. And the bigger issue is that while the soil, pipes, and structures themselves are highly engineered, the planting is almost always an afterthought. Too few municipalities treat the planting as an integral element in the functionality of the system. The main driver in plant selection is minimizing maintenance for the municipal crews who take care of them--crews who often have little horticultural knowledge (or if they do, they are trained as urban foresters, not in herbaceous systems). But the very standards aimed at minimizing labor create the conditions for increased maintenance. "Plant Diversity is functional. It arms G.I. facilities with a range of benefits that ensure the vitality of the system." There are several factors at play here. The first issue is cultural. Few folks in charge of these facilities see plants as technology or systems that need to be engineered. Instead, plants are treated as horticultural objects. It is the soil or mulch--not the plant roots--they think is responsible for the functionality of the system. And while soil and mulch do act as filters, this mindset ignores a growing body of literature that suggest that density and diversity of roots (particularly herbaceous roots) play a major role in filtration, water uptake, transpiration, and erosion control. Many green infrastructure standards only require a handful of shrubs in a sea of mulch. And because these facilities are so grossly under-vegetated, scouring rains or heavy inflows of salt or urban pollutants kill the few plants in the pits. A traditional approach to green infrastructure arranges plants as objects in a sea of mulch; the better approach is to create a diversity of plants interwoven together as shown in the design on the right by Claudia West in Lancaster, PA. This requires the right horticultural expertise, but the benefits are vast. Here's an example of a standard that perpetuates the notion of plants as objects in a sea of mulch. Designs like this require constant re-applications of mulch or hand-weeding for the life of the facility--creating high labor and costs for municipalities. The second factor is a skepticism toward plant diversity and density. I recently had a reviewer for a large scale green infrastructure facility tell me that there can be no more than three species in a facility. Only three species! The goal of limiting diversity was a perception that it would create less maintenance. But limiting diversity does just the opposite. Diversity is functional. Bioretention plantings--particularly in small urban pits--need a lot of different plants woven together in tight mosaics to be effective. There are dry rims in the upper part of these facilities, moist centers, and really wet areas near outflows or drains. This wide diversity of hydrologic conditions in a small area means that monocultures of single species are rarely effective. Diversity also arms a G.I. facility with a range of different benefits: cool-season growers that hold the soil in winter, warm-season growers that tolerate drought, short-lived plants that reseed and fill gaps, long-term plants that create stability, deep rooted plants that act as a sponge, shallow rooted plants that resist erosion. No three species can do all of this; twelve to twenty species are needed to do this. Of course, the trick in designing these systems is to make diversity look good. This can be done by limiting the height of a planting or creating seasonal spectacles with repetition of flowers. New techniques for management (not maintenance) need to be taught to show how these systems can require less input than traditional plantings. Finally, these facilities fail because they do not relate to people. The plantings are not always contextual; they are rarely beautiful. Twice this year I've had the pleasure of speaking with Nigel Dunnett, one of the world's leading experts in plant-community design. In these talks, he showed a recently installed project in London called the "Grey to Green" project. The plantings were not yet mature, but the focus on color and beauty was already apparent. Like so many of his projects, Nigel understands that functional, ecological plantings must also be gorgeous. Projects like this were not met with disdain or NIMBY-ism, but celebrated by both municipalities and the public. The solution is that municipalities need to hire the right consultants--experts in plant community design--to re-write green infrastructure planting standards. This kind of planting needs special skills and specialized knowledge, both for design and for long-term management. This is not traditional landscape architectural planting design. Engineers and landscape architecture are important leaders in making green infrastructure happen. But it is my hope that they realize the need for a new kind of expertise--a hybrid of horticulture and ecology--to develop the next generation of green infrastructure.